True Caller App-Get Rs.50 Cashback a Successful UPI Transaction by True Caller. True Caller App is A Useful App This App Use for Any call Number Treck Name Any Number. 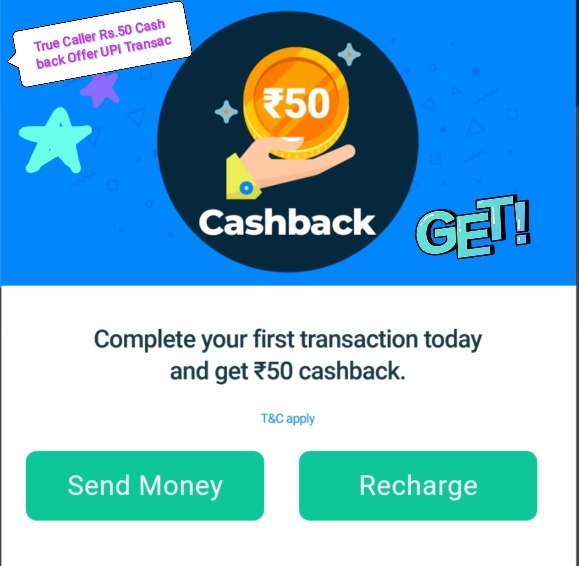 How to Get-Rs.50 Cashback on First UPI Transaction By True Caller. 1. )First Download True Caller App. 2. )Install true caller app and open. 3. )Sign up/and login True Caller Account. 6. )Do You First Send Money Rs.50 Or More.Transaction (Recharge,Bill Payment. 7.Cashback Recived Your Bank. Minimum 7 Working Days. Offer Eligible only Your “true Caller” App Offer Pop-up See. Minimum Transaction Rs.50 of Available .Cash back Received Rs.50 7 working Days. Cash back of Received to be awarded for user Complete First Transaction UPI . The Cash back Will be Received user Linked bank Account Credit 7 Working Days.